Wendy Lourenco’s journey as a burn survivor began with what she thought was a touch of the flu because she was slightly achy and felt just a bit “off”. Wendy thought her symptoms could be cured by a night’s sleep, but over the next couple days things only got worse. She had a fever, was vomiting, had pain and no energy. It was only when she couldn’t move her neck, and because of her husband Tony’s insistence, that she agreed to go to the emergency room. During her visit, Wendy stayed overnight, went on a morphine drip and was checked for meningitis. Because she had previous back problems, the doctors said that perhaps that may be the cause of her illness and she was sent home the next day. However, the next morning Wendy’s hand, knee and ankle were swollen and she was in terrible pain from head to toe on her left side. Wendy decided to go back to ER, but she thought it would be another false alarm, so she reassured her children everything would be okay. When she got back to the hospital, and after many tests, the medical staff discovered she had contracted Strep A, a sister virus of the flesh-eating disease. The same day, she was put into an induced coma and for three weeks, her body fought to stay alive. Wendy’s condition became so bad that doctors told Tony she wasn’t going to make it. After three weeks in a coma, she pulled through. However, Wendy’s recovery didn’t go smoothly from there. The doctors then told Tony they would have to amputate her legs because they didn’t think they could save them from the infection. Again, Wendy pulled through. But even after avoiding having her legs amputated, Wendy had a long physical recovery, which included learning how to walk again. For months she stayed in the hospital, enduring multiple procedures and focusing on her physical recovery. This included the third degree burns she ended up with the Strep A. 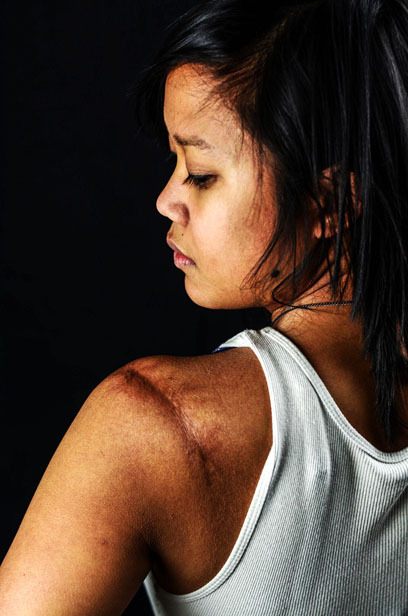 It wasn’t until she attended the World Burn Congress – an annual international conference held by the Phoenix Society for Burn Survivors – two years after her burn injury that Wendy began focusing on her emotional recovery. Wendy immediately felt a positive energy when she entered the conference and had major milestones in her recovery during that time: she cried for the first time about what had happened to her and she wore a short casual dress, daring her to show her scars. Nonetheless, there are many things Wendy’s grateful for because of her burn injury, such as being more appreciative of the quality time she spends with her family. As well, after being a stay-at-home mom for years, Wendy was inspired to re-enter the work force in September 2011. She is enjoying her job with a sporting goods manufacturer. Wendy lives in Winnipeg. She’s happily married to her high school sweetheart Tony and is a mother to three children. Since her burn injury Wendy is focusing more on finding balance in her life and living in the moments. She also volunteers on the Mamingwey Burn Survivors Society conference committee. I have been blessed to have Wendy in my life. We only met a few short years ago through her husband Tony and became instant friends. She is truly a remarkable woman and makes you appreciate every day we have as a blessing. Love you! Wendy is one of the most inspiring women in our life. Through the years we have always valued the time we have spent with Wendy. We feel we have learned so much from Wendy, especially through these last years. Wendy has shown us that you really need to live each day and take the good times and the bad times as they come. Be in the moment! Wendy is a gracious, beautiful, funny, funny lady. She is so positive and full of life and laughter. What an absolutely remarkable, inspirational person ! !